Our motto is „Experience – Quality – Flexibility“. Experience – We have carefully selected staff with long time experience at designing and manufacturing of fiber optic cables. Quality – All used materials are subjected to input control. 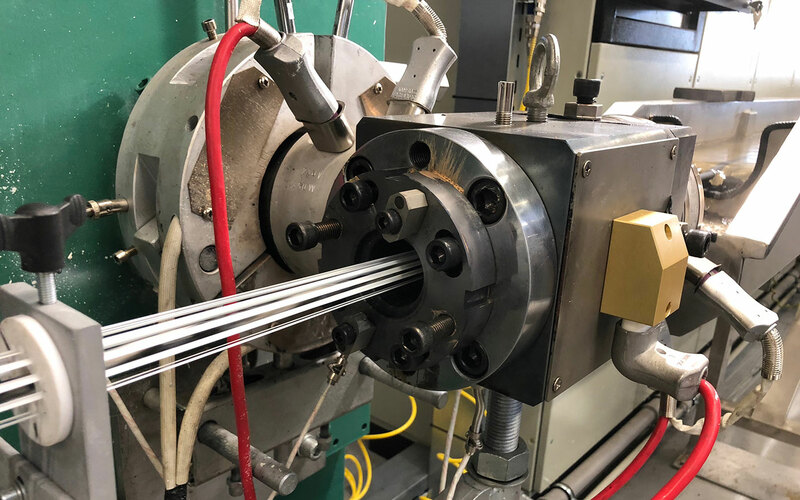 Every production process is finished by measurement of each fiber, complete cables then by complex output-control documented always by Final Test Protocol, which is integral part of each supplied cable. Flexibility – we are prepared to offer cables according to your needs in the shortest possible term, of course. We are focused on manufacture of flame-retardant to EN 60332-3 and fire-resistant to IEC 60331-25 loose-tube constructions tested in accordance with IEC 60794-1-2 standard. Loose-tube cables can contain either one single tube with coloured optical fibers (central-loose-tube = CLT), either multiple tubes (multi-loose-tube = MLT). We use either FRLSZH (Fire-Retardant, Low-Smoke, Zero-Halogen) jacketing compounds for indoor or universal (indoor/outdoor) installation either PE (Polyethylene) compounds for outdoor installation as well as other special compounds. Reichle & De-Massari Czech Republic offers range of cable constructions with increased resistance to mechanical damage (like Steel-Wire-Armoured or Corrugated-Steel-Tape armoured) suitable for direct burial installation. Our cable offering is mainly designed around a loose tube construction, either as central loose tube or multi loose tube cables to be used in outdoor or so called “universal” (indoor & outdoor) conditions.